Machining an engine block is a task that often doesn’t receive its fair share of credit. Many feel just a quick clean up of bore and the engine block is ready to be put together. To make a reliable engine, let alone a strong, high horsepower one, machine work needs to be given a serious thought and proper attention. Before anything can even be done to the engine block, it needs to be cleaned. There are two main ways in which a machine shop can/will clean your block. One method uses a dunk tank that is filled with a chemical mix, but must be properly prepared before it can be submersed. One needs to make sure all oil galley and freeze plugs or anything else that covers or goes into a hole, has been removed. The solution needs to reach all areas of the block to remove the grease and grime that has settled in these passages. If something is really stuck inside the block, there is no pressure to remove it, so is the one downfall to this method. The second way to clean a block is using a pressure cleaner. It’s a vertical standing unit that has numerous nozzles that shoot a high pressure cleaning solution at the block. Just like the dunk tank, you need to remove all the plugs, covers or anything else that covers any holes or passages. The downfall to this method is the tougher hard to reach places may not be cleaned properly. If these two methods are used together, you can achieve a block surface that’s clean and free of all contaminants. Now that your block is clean, it’s time to check for cracks and stress fractures by a process known as Magnafluxing. Typically, a very powerful electro-magnet is used and iron powder applied to show small cracks not easily seen by the naked eye. This powder then forms/collects along any cracks present in the block and makes them visible. Because aluminum is not magnetic, the magnets need to be run through the cylinders and any openings to draw the powder to any cracks that may be present. If cracks are found, it will depend on where, how deep and how long they are as to whether they can be repaired or not. Most areas that crack, usually involves a water passage or jacket. The material in these areas are usually thing to begin with. If its in an area with some material around it and its not very big, SOMETIMES it can be welded up. This is best left to the discretion of the person who is able to do the repairs. Obviously, if the cracks can't be fixed, a new block is in order. With a block that is now clean and free of cracks, it’s time to start boring the cylinders. This simple process is used to expand the current cylinder from its original diameter to a slighter larger one. This is done to not only clean up a slightly scared or scorn cylinder wall, but if putting together a stroker engine using oversized pistons. The process is done on a machine with a special bit at the end of a rod that spins within the cylinder wall to make it larger one. 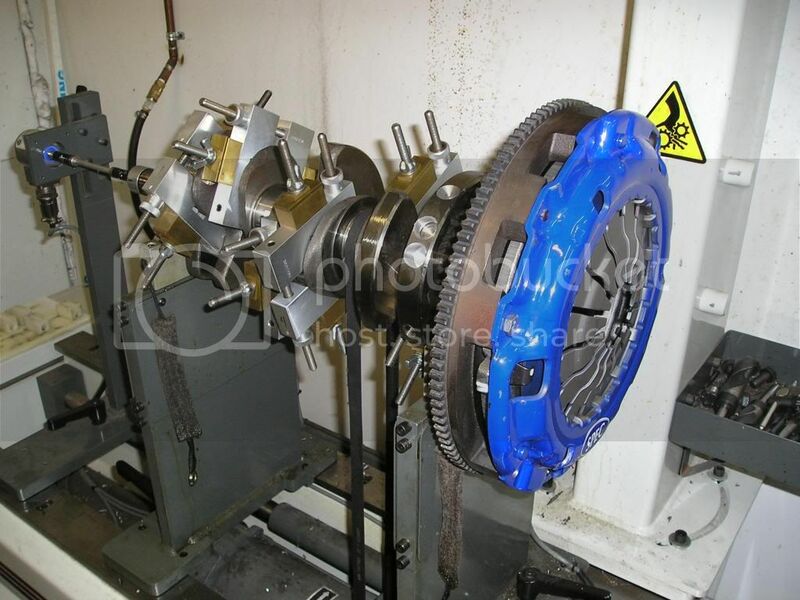 The desired cylinder diameter is dialed into the machine and as the bit spins it cuts the cylinder wall while working its way from one end to the other. When boring an engine, you want to make sure the machine shop uses torque plates. These are large metal plates bolted and torque to the block taking the place of the cylinder head during the bore process. This is done to prevent any distortion of the block that might otherwise occur during the boring process. If a torque plate is not used, you run the chance have having egged shaped cylinders when the boring is completed. Another important step when boring your block, is to also have the pistons at the machine shop. Each piston, even those made from the same cast/process, will all have a slightly different diameter. Each piston should be measured independently and those measurements transferred for use in a specific cylinder. This will ensure a match between the piston and cylinder for ideal ring seal when your engine is assembled. 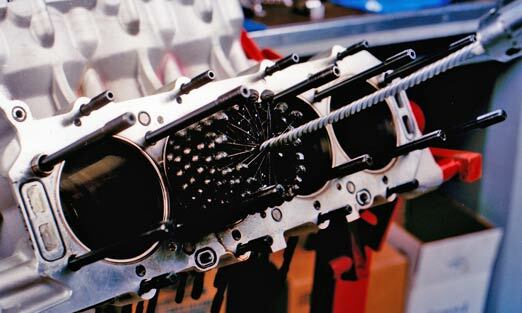 If you are working with a low mileage or recently machined block that doesn’t need the cylinder walls cleaned up, then you can use a cylinder hone. This is much quicker, not as intrusive on the cylinder walls and all that is needed. It can be done with a hand-held pistol drill and uses a multi-fingered attachment with either sanding stones or balls at the end of each finger. Even when the block has been bored, a hone is used to give it a final clean up and put the cross hatches in the cylinder walls. Align bore is just like a cylinder bore. If you are using an aftermarket set of main caps, or the original main caps have damage, you will need to align bore the main caps. Like the align hone, material is cut from the base/bottom of the main cap, then torqued to the block. When the main caps are torque down, this same arm is run through the main caps, but is done repeatedly over a longer time to remove more material than what an align hone does. Align honing is a simple and quick way to true up the main caps of a block. If a block still has the original main caps and the caps aren’t damaged or chewed up, then an align hone can bring the main bores true. The main caps will have a very small amount cut from the bottom to bring the diameter just out of round. With the main caps torqued to the block, a long arm with many stones on it is run though the mains. This spinning arm with the stones on it cuts at the main caps bore. When the process is done, you will have a true and round main bore diameter. When using new or aftermarket main caps and due to their excess material, you will first you need to align bore. Once this is complete, you can clean and finalize the main bore with an align hone. Align hone is also used when main studs are used in place of main bolts. The way studs clamp the main caps to the block, they can cause a slight distortion to the bore. The align hone trues up any distortion that can be caused when the studs are torqued. The crankshaft, rods and pistons all have a weight to them. Like a wheel and tire, if the balance is off, it creates a vibration. Vibrations in a rotating assembly can cause catastrophic failure in the engine. To balance the rotating assembly, first you need the rods and pistons to be as close to the same weight as possible. You need to weigh the piston with rod assembly and add them together for the combined weight. To get each rod/piston combo to the same weight, you can remove material from the big end of the rod until each of the assemblies all weigh the same amount. Most will have a tab at the bottom/center spot of the main cap that is used specifically for weight removal for balancing. When working with a set of rods that have been previously used, sometimes they can get just a touch out of round. Luckily, there is a simple fix to this that may allow you to reuse them. This is especially helpful if you have spent some coin on a nice set of forged rods and would rather not replace them. Like boring the main caps, the caps from the rods have just a tiny bit of material cut from the mating surface. The rod is then placed in a machine that almost looks like a mini line bore machine. This then cuts the inside of the rods larger end, the one that attaches to the crank, to the desired size needed for your application. Some damage to the crank can happen and may come in many forms. A bearing wearing away and scarring the surface or just high miles wearing on the journals of the crank are among the most common. If this damage is not too severe, you can machine the crank and have it look like new again. If the journals of the crankshaft aren't heavily gouged or scrapped you can have them polished, in lue of machining it. The crank is set in a jig and a machine with a emery cloth type band is placed on each journal. The high speed action of this machine and emery cloth like band cleans up the tiny imperfection and brings it to a new like finish. If the damage to the journals of the crankshaft are too deep for a polish, you must turn the crank. This simply means the journals are cut down to remove the gouges or grooves and the surface is clean again. If you have the crank turned, you will need to buy special bearings to make up for the material removed from the journal. They are not difficult to find, as most parts stores will carry them. You just ask for the bearing for your engine and tell them it needs to be .010, .020 or so forth over-sized. With this information, you can now at least understand and comprehend some of what needs to be done for your new engine nstallation. This will help you to communicate with your machinist and be on the same page with what your engine may need and/or parts that may be required. Last edited by 86er; April 2nd, 2012 at 07:51 PM.